CRO has its challenges, but it’s nothing we can’t conquer with the right tools — plus a little blood, sweat and tears. The conversion rate optimization (CRO) industry is certainly showing signs of growth, but ConversionXL’s 2016 State of the Industry Report shows that it’s still in its infancy. We asked 722 CRO practitioners to answer 48 questions to help us better understand the industry and the people working within it. We wanted to understand who these people are, what their optimization programs look like and where they’re headed next. Along the way, we discovered that most optimizers are struggling with three core issues: a lack of budget from top execs, a lack of time and accountability and a genuine lack of optimization know-how. 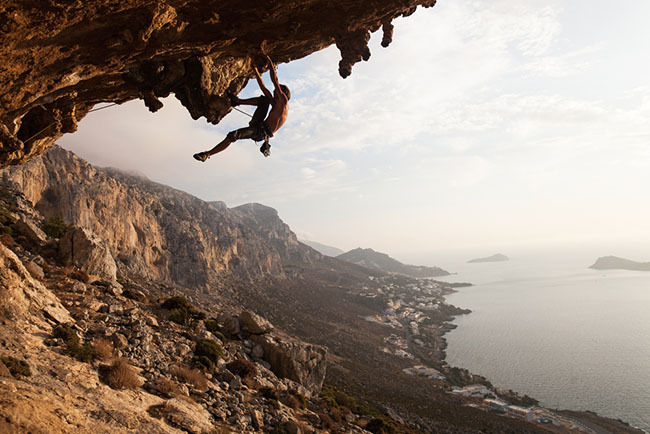 So, we decided to dive into how the average CRO professional can tackle these not-so-small obstacles. First, What Does the Average CRO Professional Look Like? The average person working in CRO is a 37-year-old male working in-house on his own site or an employer’s. He’s making about $71,340 USD per year. 72.4% of respondents were male, making CRO a predominantly male industry. 44% of respondents were from the US. An impressive 33% were from countries other than the US, Canada, UK and the Netherlands. It’s a global industry! 39% of respondents work for an agency, making in-house work the most popular (58%). Perhaps that’s a sign that agencies are not yet well-versed in CRO. Ecommerce companies are the most popular employers at 33.9%, followed by agencies (30.9%), SaaS (13.8%) and lead generation (13.5%). CRO practitioners in the US earn the most on average at $87,926 USD, followed by Canada ($78,370 USD) and the UK ($66,903 USD). Of course, the larger the company, the larger the earning potential. People who work for a company with over 500 employees earn $8,651 more annually than those who work for a company with fewer than 500 employees. In order to better understand the challenges our industry is facing, we asked an open-ended question: What is your biggest optimization challenge? It came down to three major challenges, all of which are supported heavily by the rest of the survey responses. Lack of resources is a common problem for growing industries. If it’s new, it’s less likely to get appropriate funding, right? Reported budgets range from $1,000 to $3 million. More than half (53%) of respondents do not have a specifically defined CRO budget. Another 26% have a specifically defined CRO budget, but it falls under a general marketing budget. The most commonly reported budget range is under $100,000 (the lowest amount on the survey). Honestly, the fastest way to get an increased budget is to prove the value of conversion rate optimization. 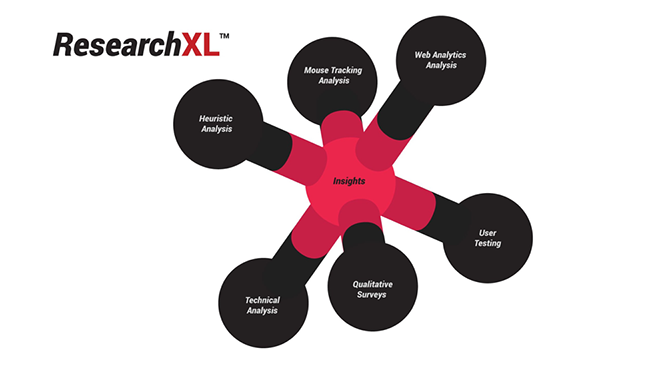 Regardless of the size of your company, you can do that using the ResearchXL model. Heuristic Analysis – Identify “areas of interest” by checking key pages for relevancy, motivation and friction. Mouse Tracking Analysis – Analyze heat maps, click maps, scroll maps and user session video replays. Web Analytics Analysis – Conduct an analytics health check. Set up measurements for your KPIs and identify leaks in your funnel. User Testing – Identify usability and clarity issues, which are major sources of friction. Qualitative Surveys – Customer surveys, web traffic surveys, live chat logs and interviews can be a valuable source of information. Technical Analysis – Conduct cross-browser testing, cross-device testing and speed analysis. Using this conversion research model, you’ll create a list of test ideas and easy fixes. If you have enough traffic to test, begin right away. If not, use the insights you’ve learned to optimize without testing. Marketers are busy people, and conversion optimization is a time-consuming process. The result? Many companies are half-assing CRO (or skipping it altogether). 41% of respondents say there is no one directly accountable for conversion optimization at their company. 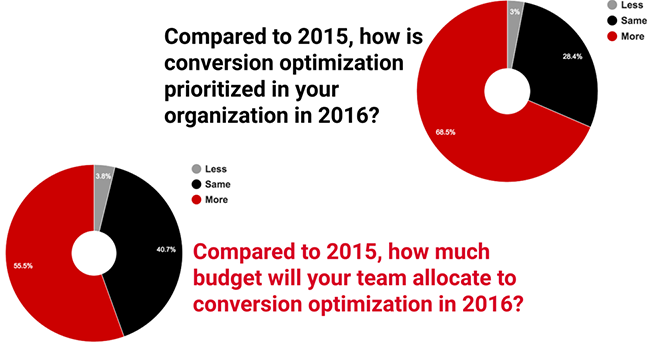 26% of respondents meet with their optimization team to discuss CRO “only when necessary”. Another 23% don’t meet more than biweekly. The majority of respondents run fewer than 5 tests a month. 43% only run 1-2 tests per month. Only 5% of respondents are running 21+ tests a month. There are two major issues here: accountability and velocity. Almost half of respondents said no one is directly accountable for CRO. What if no one was being held accountable for human resources? What if the few people responsible for it were meeting “only when necessary”? Conversion rate optimization demands accountability. Conducting research, creating hypotheses, prioritizing hypotheses, creating treatments, running valid tests, archiving test results for the future, sharing actionable insights throughout the company… it’s a big responsibility. Conversion rate optimization can yield big rewards, but you have to make it a priority. Hold someone accountable, dedicate resources towards it. You won’t get the results you read about if you just have Bill, your marketing manager, doing optimization kinda-sorta-sometimes. Perhaps you’re familiar with Morgan Brown’s presentation on high-tempo testing. Essentially, he argues that more testing means more learning and more learning means more growth. Unfortunately, over 50% of those surveyed run fewer than 5 tests per month… not exactly high tempo. If you have the traffic to test, you should be testing at a high velocity. After implementing high velocity testing, GrowthHackers.com grew from 90,000 monthly active users to 152,000 monthly active users in 11 weeks. No increased budget, no additions to the growth team. Commit to constant ideation. Start by conducting conversion research to generate ideas. Then, invite the entire team to become involved in the test ideation process. How does your engineering team, for example, think you can improve acquisition, activation, referral, retention and/or revenue? Prioritize your ideas wisely. At ConversionXL, we place ideas into one of four buckets: instrument (e.g., event tracking isn’t set up properly), just do it (e.g., buy and set up SSL), test (e.g., move less popular products to a different menu) and investigate (e.g., why the login process is slow). Then, we give them a 1- to 5-star rating based on anticipated impact. At GrowthHackers.com, they prioritize based on impact, confidence and ease. Meet weekly. Discuss the tests from the previous week. What worked, what didn’t and what did you learn? Then, use your idea backlog to create a list of tests you’ll run this week. Shoot for more tests than required to maintain a high tempo. Why? Because often, you’ll run into issues, like needing a developer’s assistance, which can delay you. Keep your test results in an archive. This prevents you from running the same test multiple times and, as a bonus, helps keep the entire team up to date on your learnings. CRO is a young industry that’s growing rapidly, which means quality resources are few and far between. Too many articles are telling you about “105 tests to run right now” and calling it educational. 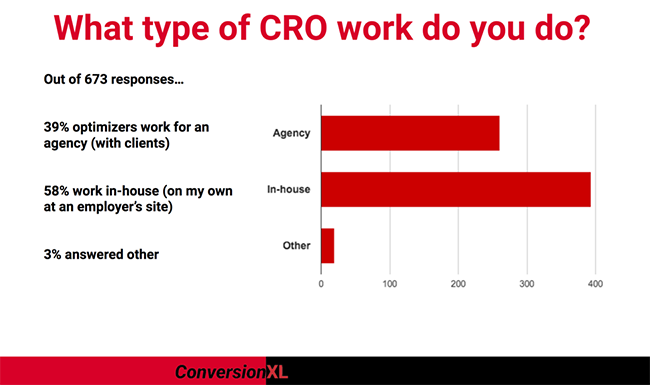 Almost 20% of all respondents have been working in their CRO role for less than a year. 7% of respondents are not archiving their test results at all. 52% of respondents aren’t tracking lift per successful experiment and 63% do not track the percentage of winning tests. 56% of respondents do not have a standardized stopping point for A/B tests. The most popular optimization know-how source is blogs. Companies with a structured process are more likely to increase their CRO budgets next year than those without a structured process. They’re also more likely to have plans to focus more on CRO in 2016. Unfortunately, 65.7% of respondents do not have a documented, structured conversion optimization process. The smaller the company, the less likely they are to have a documented, structured conversion optimization process. 42% of companies with more than 500 employees have a structured process while only 32% of companies with less than 500 employees can say the same. Without a structured optimization process, marketers are taking educated guesses at best. They are testing based on gut feeling or “common sense” instead of conversion research. They’re stopping tests without regard for sample size because they see a minor early uplift. Conduct conversion research (qualitative and quantitative) to identify opportunities to improve clarity and relevancy and reduce friction and distraction. Prioritize those opportunities based on impact and ease of fix. So, if it can be fixed right away, just do it. If it needs to be tested, create a hypothesis. If you have enough traffic to run a valid A/B test, begin testing your hypotheses in order of anticipated impact. Only stop the test when you have reached a representative sample size. Record the results and learnings in an archive. Even failed hypotheses are valuable. Undeniably, the conversion rate optimization industry is growing and expanding rapidly, but we have a long way to go. Small budgets, small teams and a genuine lack of know-how are only three of the barriers that optimizers will have to overcome in the next few years. Shanelle does content and growth at ConversionXL and ConversionXL Institute, which helps you improve your conversion rates and drive more revenue growth with expert training and actionable insights from the latest CRO research. She's a jill-of-all-trades marketer with a background in PPC, SEO, content marketing, analytics and PR.